Ellie and Kate are excited about visiting Prince John and can't wait to meet his ponies. Ellie is enchanted by the snowy mountains, but when they go riding they discover that snow isn't always fun - it can be scary. Will Ellie and her friends have to spend the night in the freezing white wilderness? Diana Kimpton has two passions - horses and writing. So it is no wonder that Diana creates brilliant pony stories, which demonstrate her own love and understanding of ponies. Diana also has a mischievous sense of fun, not unlike Princess Ellie! Diana has written a number of books and television scripts for children. She lives on the Isle of Wight, just a short walk from the sea. Visit www.dianakimpton.co.uk to find out more. Ellie groaned as she sat back in her seat. “I have,” said Kate. “It’s brilliant. Mum and Dad took me skiing once in the school holidays.” Kate’s parents worked abroad and moved around a lot so she lived with her grandparents most of the time. Her gran was the palace cook. “Let’s ask if we can go up there and play snowballs,” suggested Ellie. forests and fast-flowing mountain streams. Andirovia really was as wonderful as John had described. The car slowed down. It was the second in a line of gleaming black vehicles. Each one had a small Andirovian flag fluttering at the front. The first car held Ellie’s parents, the King and Queen. The ones behind held their luggage and servants. To Ellie’s disappointment, there was no horsebox. The King and Queen had insisted that all her ponies stayed at home. She was already missing them. So she was delighted when she found the hold-up was caused by a lady riding a large, grey horse. The road was narrow here, so there wasn’t room for the cars to overtake the rider safely. They had to drive slowly behind her until she turned into a gateway to let them through. As her car swept past, Ellie gave the lady a royal wave, exactly as Miss Stringle had taught her in her waving lessons. “What a beautiful horse,” she sighed. “Where?” asked Kate, who’d been staring out of the opposite window. She turned round just in time to catch a glimpse of the grey and its rider before the car overtook them completely. Determined to see more, she swivelled round so she was kneeling on her seat. Then she watched them through the back window, waving wildly at the rider with both hands. “But I’m not royal,” said Kate. Ellie was desperate to cheer Kate up. She knew her friend was nervous about coming on the royal holiday. But she had every right to be there. She had her own gold-edged invitation from the Emperor and Empress of Andirovia. Prince John had insisted on it. Ellie stared at her in surprise. Her governess didn’t usually have so much confidence in her abilities. At that moment, the cars rounded a bend and Ellie saw Prince John’s home for the first time. “Wow!” she said for the second time that day. John had been telling the truth. His palace really was twice the size of the one she lived in. It was built of white stone, with strong towers at each corner like a castle. “Look! There’s a moat,” cried Kate. “And a real drawbridge,” added Ellie as the car whizzed across it and drew to a halt in the palace courtyard. The palace guard snapped to attention and the Emperor and Empress of Andirovia walked majestically down the front steps. Prince John was close behind, looking uncomfortable in his naval uniform. He peeped round his father and grinned at the girls. A footman swung open the car door and a blast of cold air rushed inside. Ellie shivered and pulled her velvet cloak tight around her shoulders. Then she climbed out and led Kate over to join the King and Queen. The guardsmen looked bored, too, and very chilly. Their noses were red, their lips were blue and some of them were struggling to stop their teeth chattering. Ellie felt sorry for them. She felt sorry for herself as well and longed to get indoors. Ellie wasn’t impressed. Cold weather would be fun if there was snow to play in. If there wasn’t any, she much preferred to be warm. Perhaps Andirovia wasn’t such a great place for a holiday after all. A heady cocktail of princesses, horses and mystery is enough to make any girl giddy. The text trots along with humour and enough horsey fact to hold the attention, while the lovely drawings help fit faces to story. Full of authentic pony facts and sparkly princessy detail this series is sure to set the mind of any pony mad or aspiring pony mad child alight from around 6+. 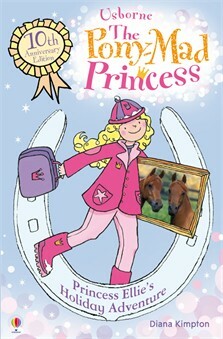 A sparkling new series of books from Diana Kimpton all about ponies, adventure and being a princess - they're full of authentic details about riding and looking after horses, as well as Princess Ellie's palace life (which isn't always as fun as it might seem)! Send a Princess Ellie ecard to other Pony-Mad people you know! Read Diana Kimpton's story starter for the Usborne Young Writers' Award 2010.